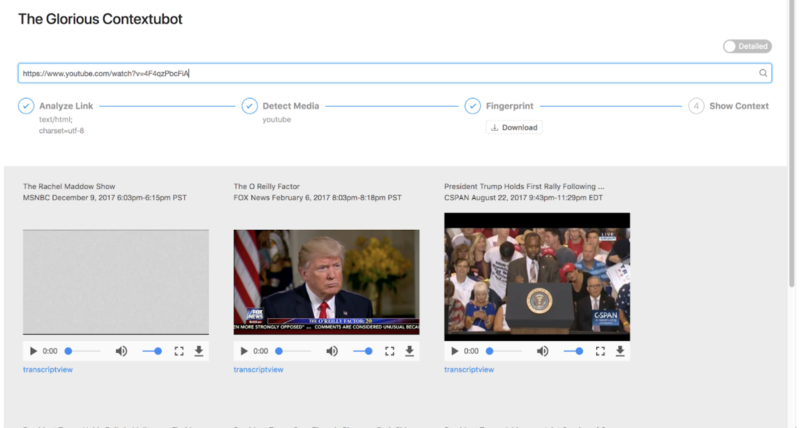 This week, we present an update on the video context project Glorious Contextubot, two recent news reports that use TV News Archive data, and fact-checks of TV appearances by the DNC chair and the president. Let’s say a friend posts a YouTube video link to a politician’s statement on Facebook, but you have a feeling it’s taken out of context. The clip is tightly edited, and you’re curious to see the rest of the statement. Was the politician answering a question? Was the statement part of a larger discussion? Enter the Glorious ContextuBot. For the past nine months, veteran media innovators Mark Boas and Laurian Gridnoc of Hyperaudio and Trint, led by the Internet Archive’s own Dan Schultz, senior creative technologist of the TV News Archive, have been building a prototype of the Contextubot, fueled by the TV News Archive. The Contextubot is one of 20 winners of the Knight Prototype Fund’s $1 million challenge, announced in June 2017. With the ContextuBot, it’s possible to use video to search video. Just paste a link to a video snippet into an interface and then pull up a transcript that puts things in context of what came before and after. Built from the Duplitron 5000, an audio fingerprinting tool Schultz developed to track political ads for the Political TV Ad Archive, the ContextuBot demonstrates how open technology built by the TV team can be repurposed and improved by motivated technologists – one that’s already captured the attention of the University of Iowa Informatics department, which is considering adopting it for researchers. Made it easier to scale audio search. It’s now possible to scale up and down audio fingerprint finding within a corpus of TV news by adding or removing individual computers or compute clusters. Our Duplitron would take eight hours to search a year of television, but the ContextuBot makes it much easier to spread that computing across multiple machines. Built a demo interface. You can see a clip in context with a transcript of what comes before and after. Click on a word in the transcript, and you’ll be able to jump to that point in the video stream. Begun to explore a “comic view.” The team’s biggest goal is to explore ways to communicate the essence of a longer clip in a short amount of time. One approach: converting video into a comic. This would set the groundwork for automatically extracting (and rendering) a storyboard from a video clip. The team will present the prototype shortly before the International Symposium of Online Journalism conference in Austin in April 2018. After a heavy news week of developments related to Jared Kushner, President Trump’s son-in-law and a senior adviser, The Washington Post’s Philip Bump dug into the TV News Archive and found that while MSNBC and CNN had numerous mentions of Kushner’s name, Fox News had just ten. 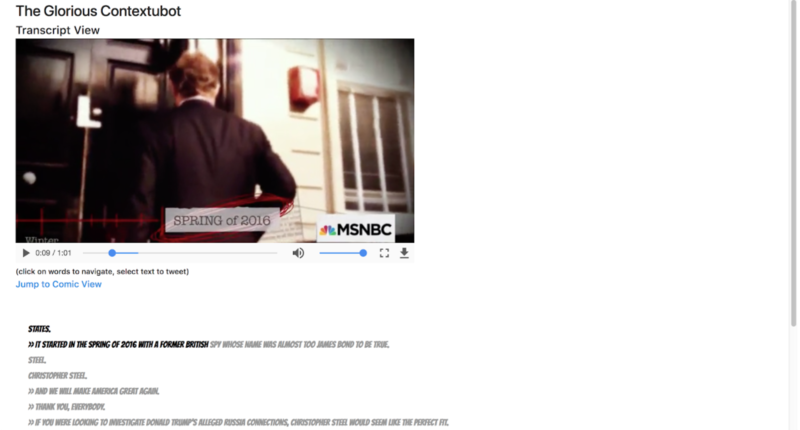 Rachel Siegal used the TV News Archive to compare coverage of the Parkland shooting with several other high-profile shootings, and found that this time cable TV attention spans are a bit longer. This entry was posted in News, Television Archive and tagged Bad Idea Factory, Contextubot, Donald Trump, duplitron, Factcheck.org, Jared Kushner, NRA, Parkland shooting, Pat Toomey, Political TV Ad Archive, The Glorious Contextubot, The Washington Post's Fact Checker, Tom Perez. Bookmark the permalink.